Heat oven to 350°F. Let cookie dough stand at room temperature 10 minutes to soften. Spray 12-inch pizza pan with Crisco® Original No-Stick Cooking Spray. In medium bowl, break up cookie dough. Add flour, ground ginger, crystallized ginger, cinnamon and nutmeg. Mix with wooden spoon or knead with hands, until well blended. Press dough evenly in bottom of pan. In medium microwavable bowl, microwave white chips on High 1 minute to 1 minute 45 seconds, stirring every 30 seconds, until smooth. Add cream cheese, cream and lemon peel; beat with electric mixer on medium speed until smooth. Spread mixture over cooled crust. 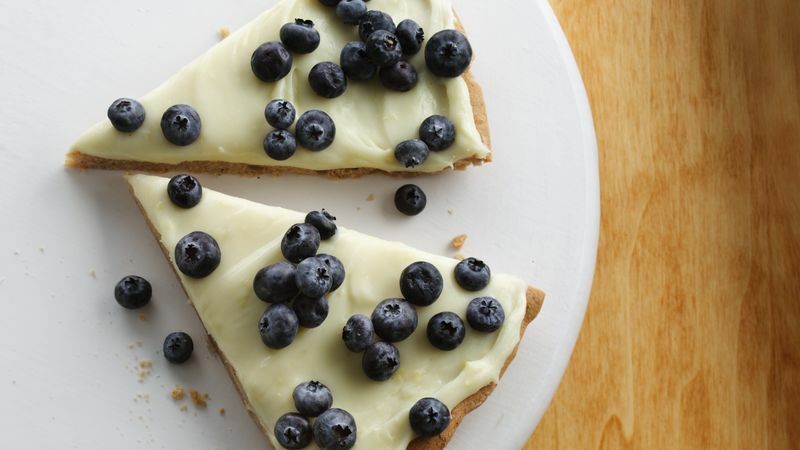 Arrange blueberries over cream cheese mixture; press into filling. Refrigerate 1 hour. Cut into wedges. Store in refrigerator.